With so much to see and do, here are our top suggestions if you are heading to the Riviera Nayarit this winter. 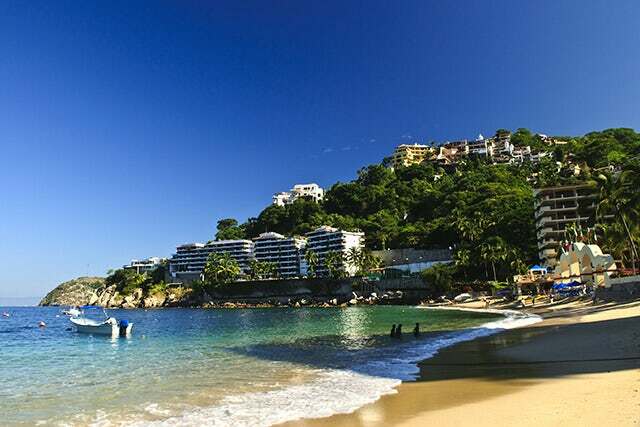 The popular tourist spot of Riviera Nayarit boasts a full selection of hotels and resorts from comfortable to luxurious. There is no shortage of activities to keep you entertained from golfing to whale watching, experiencing ancient cultures or enjoying a variety of cuisine. With so much to see and do, here are our top suggestions if you are heading to the Riviera Nayarit this winter. Travel north into the majestic Sierra Madre Mountains for an unforgettable visit with the Huichol Indians, believed to be the last tribe in North America to have maintained their pre-Columbian traditions. They are known for their beautifully intricate yarn and bead work. Their shamans and healers still practice today as they have done for generations. The name Rincon de Guayabitos means "corner of little guava trees" in reference to the guava orchards that used to be planted throughout the bay area. During the winter months visit the Tianguis, an open-air market open on Monday from 8am-1pm in the plaza in Guayabitos. The market is a must for handmade accessories, silver jewellery, pottery and the famous Huichol Indian art. Sea Turtle and baby sea turtle releases are a major attraction to visitors in Riviera Nayarit as thousands of Olive Ridley Turtles, who were born on the region's beaches, return every year to nest and lay their eggs. There are several sea turtle adventure excursion and baby sea turtle release programs available. If you are lucky enough to be in the Riviera Nayarit from mid-December to the end of March, you may catch a sight of whales as they migrate back to the warm waters of Banderas Bay for the winter months, where they feed, mate and give birth. Blue Whales, Sperm Whales, California Grey Whales, Humpback Whales, Orca Killer Whales and many species of Dolphin can be spotted. Even if you're staying at an all-inclusive resort it's well worth venturing outside of your hotel for a taste of Mexico. The restaurant El Dinamite offers a delicious home-made selection of local dishes. However, there is no menu; the whole experience starts with the owner coming over to your table to customize the perfect meal. A truly unique experience at an affordable price. The spa's distinctive "Huichol Collection" treatments at the luxurious Grand Velas All Suites & Spa Resort are derived from the ceremonies, rituals and ingredients used by this ancient native Mexican-Indian tribe. This is a great way to discover restaurants, specialty shops, jewellery stores, boutiques and art galleries. Luxury sailboats and yachts add to Marina Vallarta's cosmopolitan atmosphere. If a challenging game of Golf is part of your holiday plans then the Paradise Village's El Tigre Golf course is a must. 18 holes, par 72 with 144 sand traps distributed over 7,329 yards offers an exhilarating experience for Golf lovers. Take a cruise across Banderas Bay to enjoy the sunset and as darkness falls you will be mesmerized by the shimmering lights along the coast. The excursion includes a buffest dinner of fresh vegetables, salads and hand-made tortillas, a large selection of deserts, plus music and a dance show.